Wondering how you’re going to make it through the day? Coffee. Need a way to make your night more productive? Coffee. Trying to find a smooth way to ask someone out? Coffee. Coffee has become a mindless solution to the daily problems of Americans’ lives, serving as a source of instant energy, long-lasting focus and social opportunities. Yet, the source of coffee itself remains largely unknown. Although grabbing a cup of your favorite coffee takes 10 minutes and a couple dollars, the story behind it is by no means as short or cheap. 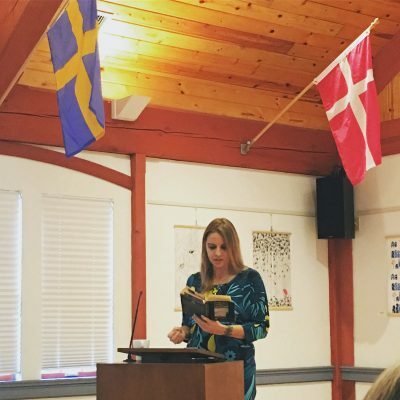 In an attempt to share the true story behind the ostensibly simple bean-brewed delight, author and literary enthusiast Erika Koss delved into the complex coffee production process in her reading of her soon-to-be-published book “Magic Beans” on Saturday at the Scandinavian Cultural Center in Newton. “We began chatting about her book, and I was struck by her story and her mission to tell not only her story, but the story of the many women whose lives coffee has shaped and continues to shape,” said Kerry Lavin, the director of the center. Koss said she was drawn to the beauty of words at a young age, developing into a voracious reader until she read “Out of Africa” by Danish author Karen Blixen. That was when she realized that she too wanted to test the power of writing, Koss said. Blixen’s book shifted Koss’s attention to Africa. This mere shift of attention soon developed into a trip to Kenya in 1994. After more visits to Kenya, Uganda and Rwanda, Koss said she cultivated a passion for the underrated stories and unappreciated work that remained quietly within the hearts and hands of local women. In particular, Koss said she noticed the women’s dedication to the production of coffee. As she watched the local women wash each bean by hand, Koss reflected back to her days of being a coffee brewer at Starbucks immediately after college in San Diego. Although miles apart, both Koss and the workers viewed coffee in the same way — the sole source of income and, therefore, the sole source of survival. To Koss, coffee was no longer just a drink; it was a source of connection between strong women around the world with stories to tell. As Koss’s adulation for these women grew, so did their conversations revealing the inspiring spirit they possessed throughout life’s struggles. Through her literary works and talks, Koss said she aims to rouse women and men around the world to abandon the familiarity of silence and vocalize their pain. Koss refused to let her and other women’s struggles remain unknown. With her upcoming book, these stories will be shared with the public. But despite her drive to empower these women, she said she also wants to emphasize a connection to daily life, which she found in coffee. “What I really want people to understand through this book is that coffee is a gift,” Koss said. Beyond reaching out to women, “Magic Beans” touches on the theme of struggle and the politics of trade involved in coffee making. Besides the female labor, the story behind coffee comprises of layers of political struggle, third-world versus first-world country tension and trade deals. Koss continues to teach writing at Northeastern University, and she said hopes to inspire her students to share their stories through writing. “At the heart of everything I love most, I love words,” she said. Of course, this was evident in the way she spoke about her passion to give a voice to the voiceless.